Choco-Story is an attraction in Bruges which tells the story of Belgian chocolate making over the years. 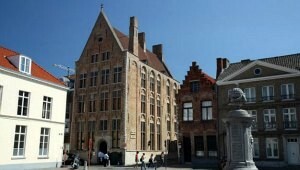 The museum is located inside one of the city’s tallest historic buildings, dating back to 1480. You make your way on a journey through the rooms of the museum as the story is told through displays and sign boards. You learn about the history of chocolate making in Belgium and how Bruges played its part. You see how chocolate has evolved and how the Belgians made the most of how to craft it in clever ways. In one part of the museum, there is a huge display of historic chocolate moulds for example. There are also displays on chocolate packaging from over the years. Look out for the giant chocolate egg which is on display too. It’s about this point in your visit when you start to think that it’s a shame there isn’t more chocolate to eat! This is made up for at the end of your tour however when you see the chocolate making area. Here you see how Belgian chocolates are crafted and there’s a few to try too. We enjoyed our experience, but we still feel it could have done with more chocolate. Choco-Story, the Chocolate Museum is open daily from 10am to 5pm. Adult admission is 8 Euros, but there are reduced rates for children an students (2015 prices).